, Eurasian and North African leguminous herbs of the genus Melilotus of the family Leguminosae (pulse family). Sweet clovers, now widely naturalized in North America, are used as forage, cover, and soiling crops. any plant of the genus Lespedeza, leguminous herbs or undershrubs of the family Leguminosae (pulse family); native to North America, Asia, and Australia. See bulletins of the U.S. Dept. of Agriculture. High in protein, contains 4 phytoestrogens. Helps regulate hormone balance and protect the body from cancer and other side effects of estrogen dominance. Also has isoflavones for cancer prevention. Helps enlarged prostate, menopause, hot flashes, skin healing, wounds, psoriasis. Red clover blossom and garlic- help thin blood, keep blood vessels pliable and reduce cholesterol, which alleviates high blood pressure and reduces the risk of blood clots. Clover blossoms are an expectorant, good for spasmodic coughs, bronchitis, asthma. Floral infusion in a douche helps alleviate vaginal itching. Plant red clover under fruit trees to provide lots of nutrients and nitrogen for the fruit trees. The roots go down 128 feet! It brings back serious nutrients from deep down. Use the flower. You can use the leaves but it may cause you gas unless you blend it up really good or make a tea with it. It’s best to not harvest red clover late in the year because it starts producing poison alkaloids. Never ferment clover- eat it fresh or dried, never in between. Dried flowers good for tea. The root is edible. Dried seed pods, leaves and flowers can be ground into powder. Flowers are sweet, anise-like with a hint of licorice. Raw flower heads can be difficult to digest. TOXIC LOOKALIKE- Crown Vetch, which has different leaves. Clover leaves look like clover, while crown vetch has little thin leaves on each side of leaf stem. (Trifolium), a genus of perennial and annual herbaceous plants of the family Leguminosae. The stems are cylindrical. The leaves are ternate; in some species they are palmatisect, with five to nine leaflets. The flowers are small and are usually red, pink, yellow, or white. They are gathered into inflorescences in the form of spherical heads or, in some species, racemes. The fruit is a leathery pod with one or two seeds (rarely between three and six seeds). The roots are rodlike, cylindrical, or spindle-shaped thickenings. In some species a rhizome develops. Nodules containing bacteria that assimilate nitrogen from the air form on the rootlets, increasing the fertility of the soil. There are approximately 300 species, distributed primarily in Europe, Asia, North America, Australia, and some regions of Africa. In the USSR there are approximately 70 species. The majority of clovers are valuable fodder plants with high protein content. The perennial species of clover that are widely distributed in the USSR include red clover (Trifolium pratense), alsike, or Swedish, clover (T. hybridum), and white clover (T. repens). They grow wild and are cultivated in field and fodder crop rotations. The annual clovers that are valuable fodder plants include Egyptian clover (T. alexandrinum), Italian, or crimson, clover (T. incarnatum), and reversed clover (T. resupinatum). The most widespread wild clovers are zigzag, or cow, clover (T. medium) and strawberry clover (T. fragiferum). The most important cultivated species is red clover, which is grown in almost all the countries of Europe, America, Asia, and New Zealand. Red clover has been sown for more than 200 years in Russia. In the USSR it is the most common fodder plant of the family Leguminosae. It is cultivated in almost the entire forest zone, in many regions of the forest-steppe zone, in mountainous regions, and on foothills. According to morphological and biological characteristics, red clover is divided into two basic varieties— T. pratense serotinum and T. pratense praecox. The former is a winter variety; it is more winter hardy and longer-lived than T. pratense praecox, which develops in spring. When planted in southern regions in the early spring without cover, T. pratense praecox yields seed in its first season. It is grown in the southwestern part of the clover-sowing zone and in many western regions of the USSR. T. pratense serotinum is cultivated throughout the northern and northeastern regions and in many central and northwestern regions; it is also cultivated in Siberia. Although clover requires moisture, it does not tolerate an excess of it. It develops best on slightly acid or neutral soils (pH 5.5–7.0). It is responsive to organic and organomineral fertilizers used for the cover or predecessor crop. In field rotations clover is cultivated in pure form and mixed with grains and other leguminous herbs. For pure sowing the seeding rate is 14–16 kg per hectare (ha); in a mixture with timothy, 13–15 kg per ha of clover with 3–6 kg per ha of timothy. Clover is harvested for fodder in its budding stage, or early blossoming. In order to obtain seeds, certain sectors are separated from general sowings or special seed plants are marked out. The principal agents of cross-pollination are bumblebees and common honeybees. On the best farms the total yield is up to 400 centners; of hay, 60–80 centners; and of seeds, up to 3–4 centners per hectare. Red clover is used as green fodder, hay, herbal meal, and silage; it is also used in grass mixtures when sowing hayfields and pastures. The chemical composition of red clover averages 77.1 percent water, 3.8 percent protein, 0.8 percent fat, 6.5 percent cellulose, 10.1 percent nonnitrogenous extractive matter, and 1.7 percent ash. One hundred kg of green mass contains 19.8 fodder units and 2.7 kg of digestible protein. In the USSR, alsike clover grows wild in the European USSR, the Urals, Crimea, and the Caucasus. It is cultivated in several regions, including the Baltic Region. It is moisture-loving and demands less in terms of soil than red clover. Agricultural procedure is basically the same for alsike clover as it is for red clover. Alsike clover is a valuable fodder plant. Because of its bitter taste, it is less readily eaten in pure form than red clover. It is advisable to feed it to livestock in a mixture with cereal plants. White clover is distributed almost everywhere in the USSR. It is distinguished for the diversity of its forms, few of which are cultivated. White clover is principally a pasture plant. 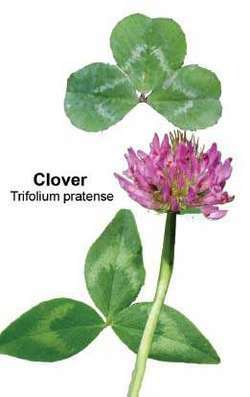 It is used in mixtures with other clovers and cereal plants for creating long-term pastures. It tolerates grazing well and grows quickly. In the USSR a great deal of scientific work is being conducted in the study and breeding of clover. Six varieties of alsike clover, 117 selected varieties of red clover, and four varieties of white clover have been regionalized in the USSR. Bobrov, E. G. Novye dlia kul’tury vidy klevera. Moscow-Leningrad, 1950. Klever, 2nd ed. Moscow, 1963. Sergeev, P. A. Klever na semena. Moscow, 1965. A common name designating the true clovers, sweet clovers, and other members of the Leguminosa. A herb of the genus Trifolium. A protocoll similar to packet radio or AMTOR.